…This conclusion was drawn from a study conducted by the policy and communications consulting firm Hamilton Place Strategies. 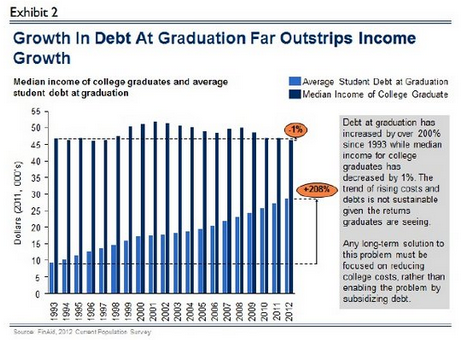 The study found that while average student debt at graduation has skyrocketed by 200 percent since 1993, income growth has stagnated. In 2012, the median income for all college graduates was $46,412 while average student loan debt was $28,720, the study found. HPS’s analysis comes as student loan interest rates doubled for new college students taking out subsidized Stafford loans due to Congressional inaction. Many experts have warned that outstanding student debt — which has surpassed $1 trillion by some estimates — may hurt the economic recovery. Indeed, college graduates are already having a difficult time balancing ever-growing student loan payments against declining wages. Between 2000 and 2011, the wages of college graduates actually dropped by 5.4 percent, according to a 2012 report from the non-partisan think tank Economic Policy Institute. HPS found that from 1993 to 2010, the typical graduate’s monthly student loan payments grew roughly 300 percent, from $100 to nearly $300.